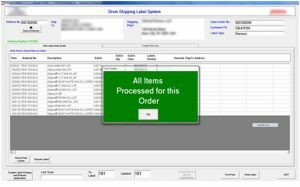 Our in-house software engineers are experts in integrating labeling solutions with peripheral equipment as well as writing software to meet specific company requirements such as reports and alerts. Below are several examples of custom software solutions that were developed to meet customer specific requirements. Off the shelf label design and enterprise software is also available.